Who knew a man spending nearly 25 hours in a downtown Seattle tree could create an online phenomenon, generating fans across the country. Hillary Clinton was in town. Islamic extremists had just killed dozens in Europe. But what story did Seattle news consumers want Tuesday? A bearded man perched in a tree. 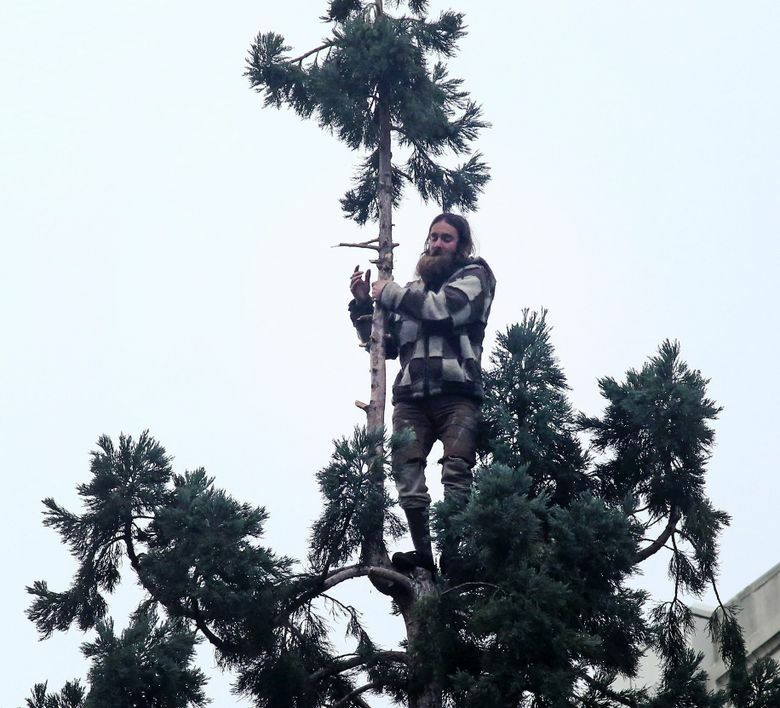 The bizarre incident — which could have easily taken a dangerous turn — went viral online within hours of city police first responding to a passer-by’s 911 call about the man in the 80-foot-tall sequoia tree outside the downtown Macy’s store. “It’s a fun story you would, they say, share around a water cooler” years ago, though now the equivalent is sharing on Facebook, said Hans Meyer, associate journalism professor at Ohio University, who specializes in web research and credibility. “As humans, we’re attracted to that quick hit, that shiny thing that attracts our eyes, but what we really need is the information” to contextualize it, Meyer said. Only in Seattle, some on Twitter joked, would a beanie-wearing man climb a tree and then hurl apples at medics. Amid cheers, 28-year-old Cody Lee Miller returned to the ground shortly before noon Wednesday after crisis-intervention specialists spent nearly 25 hours trying to get him down. But as he stayed overnight in a makeshift nest of branches, the stint became an Internet sensation, attracting the attention of fans and reporters from across the country, including The New York Times. Miller was arrested shortly after medics hauled him onto a gurney and took him for a medical evaluation after returning to the ground. He refused to appear in court Thursday afternoon for a bail hearing — a judge found probable cause to hold him for investigation of malicious mischief — so the court hearing is rescheduled for Friday. For days, more seattletimes.com readers went for coverage on Miller more than any other story on the site. The #ManInTree phenomena sparked marketing opportunities, a parody account on Twitter and even jokes about Miller being a presidential candidate. Twitter users used the “ManInTree” hashtag in more volume by the hour than keyword mentions related to major city news in recent months, such as the devastating explosion in Greenwood this month or Democratic presidential candidate Bernie Sanders’ visit last weekend, according to a Geekwire analysis. Nathan Wilson, assistant news director for KOMO news, which took over domain-name rights to manintree.com so audiences would be redirected to its coverage, reported on Twitter Tuesday afternoon that the news outlet’s live video broadcast of Miller reached 420,000 screens. I've just ate a taco salad while watching #ManInTree livestream. My tuesday can't get any better. By comparison, about 2,800 tuned in for Democratic presidential candidate Clinton’s rally in Everett the same day, Wilson said on Twitter. Seattle: Where the visit of a presidential candidate is overshadowed by a #ManInTree. The story’s universality, or general appeal to a wide audience, fueled its viral spread, Meyer said, adding people online may have connected with the story’s apparent themes of “one man’s fight against the system” or “one man’s love for a tree,” for instance. But the impact of such a story relies on the work of journalists, who should provide context to separate their coverage from other content on the web, he added. “We all want to stand around and say, ‘Look at that guy’ … It may be funny now, but what if he fell out?” of the tree, he asked. In this example, for instance, journalists can provide context on the man’s well-being or the state of the tree, Meyer said. Carrie Brown, director of the social journalism master’s program at the City University of New York, said in an email it’s difficult to predict what stories go viral. Research shows that emotions tend to prompt sharing, she said, and typically positive ones more than negative ones, though people’s outrage toward a topic sometimes contributes.